The SK and DSK series of rail contacts provide a high-quality connection to the rail web with a very low contact resistance. 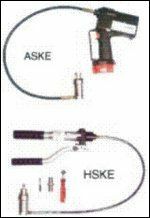 ERICO also offers two reliable hydraulic insertion tools – the HSKE and the ASKE. Used for earthing and current return connections. SK Single Rail Contact – Ideal solution for signal engineering, earthing, traction current return and similar applications. DSK Double Rail Contact – Ideal for use in confined spaces (such as around points) and for signal engineering, earthing, traction current return and similar applications.